2. Tate, Joe I'm Free [alt. vers.] [unissued] uniss. 3. Tate, Joe Rock & Roll Mama [unissued] uniss. 4. Tate, Joe I Guess It's Love [unissued] uniss. 9. Davies, Bob Hole In The Bucket Rama (N.Y.) RR-213 1956/Nov. 10. Davies, Bob Rock To The Music Rama (N.Y.) RR-213 1956/Nov. 14. LaRue, Roger Baby Take Me Back Rama (N.Y.) RR-226 1957/Apr. 17. 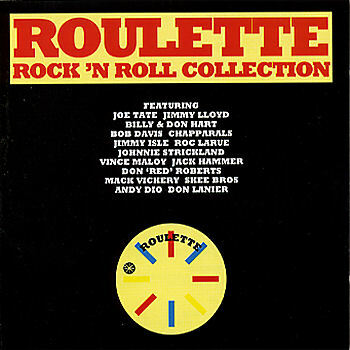 Strickland, Johnnie That's Baby Roulette (N.Y.) R-4335 1961/Feb. 22. Lanier, Don Private Property [alt. vers.] [unissued] uniss. 24. Vickery, Mack Goin' Back To St. Louis Gone (N.Y.) 5085 1960/Feb. 26. Dio, Andy Daisy Belle Gone (N.Y.) 5038 1958/Aug. 27. Lanier, Don Ponitail [!] Girl [alt. vers.] [unissued] uniss.